From the ForgottenBook: Mosholu Parkway is among the many Native American place names that have been woven into the city’s fabric. 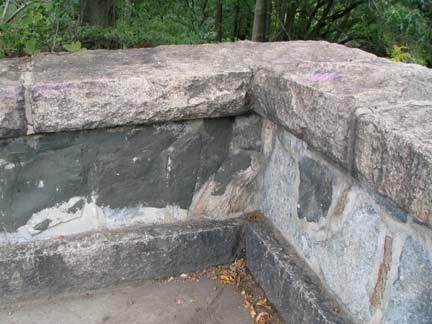 Mo-sho-lu, or “smooth stones” was the Algonquin name of a rural brook running through the heart of what became the Bronx’ Spuyten Duyvil and Riverdale neighborhoods. 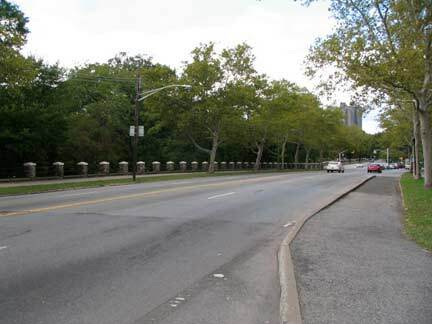 In 1888, Mosholu Parkway was laid out as a true parkway, a relatively narrow carriage road lined with trees and foliage, along a former waterway known to the Dutch as Schuil (anglicized as School) Brook. 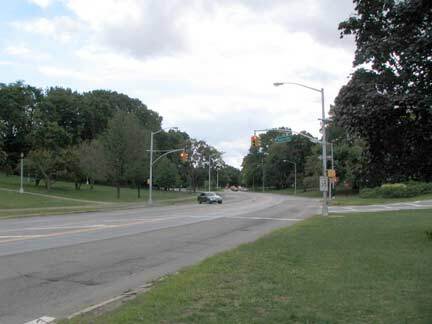 Mosholu Parkway originally ran only between Bronx and Van Cortlandt Parks, with through traffic running in the center and local and commercial traffic on the service roads. 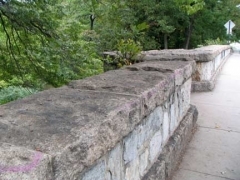 The general concept of the parkway system, devised by master urban architect Frederick Law Olmsted in the 1860s, was to extend large parks by making the roads that connected them into parks themselves. Olmsted’s vision can be seen in Brooklyn’s Ocean and Eastern Parkways, and in the Bronx’ Mosholu Parkway and Pelham Parkway (whose official name is the Bronx and Pelham Parkway because it connects Bronx and Pelham Bay Parks). 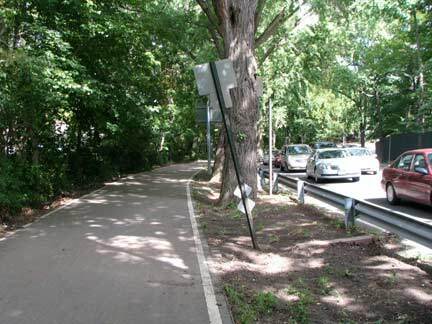 Mosholu Parkway’s original stretch between the Bronx and Van Cortlandt Parks is still wonderfully intact. 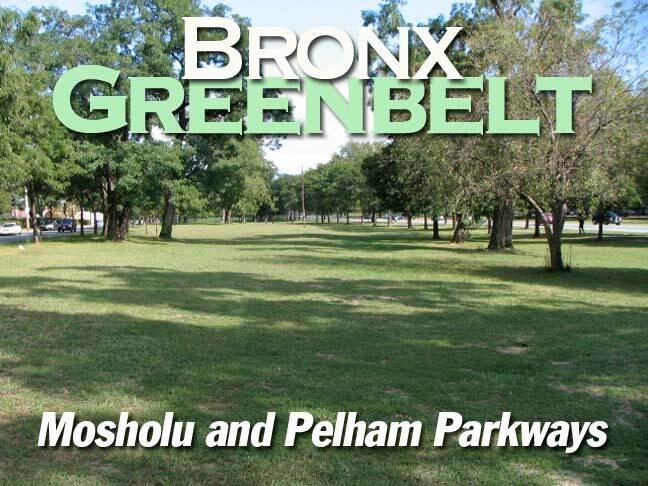 On a partly sunny September Saturday, I walked the Bronx Greenbelt. 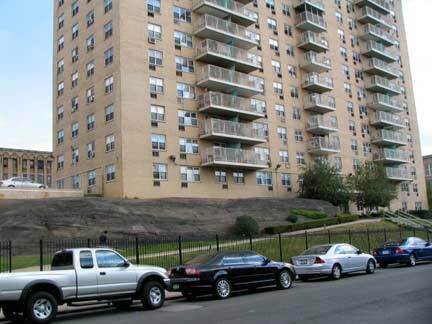 To most New Yorkers, and certainly much of the USA, The Bronx perhaps brings to mind gritty urban landscapes, perhaps Paul Newman in Fort Apache, and successive Presidents Jimmy Carter and Ronald Reagan standing on a destroyed Charlotte Street in Crotona Park, which in the 1970s and 1980s had been torched almost beyond the ability to recover. Few recall that the Bronx, acre for acre, has more parkland than any other borough; the city’s largest parks in area are in the Bronx including Pelham Bay Park, the biggest of them all. 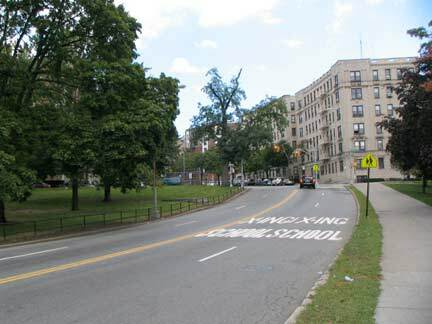 FNY’s route today combines modern built-up Bronx with the Olmsted and Vauxian concepts of true parkways — vehicular transitways in the middle of walls of green. Beginning my journey at the Bedford Park station on the D at the Grand Concourse, I was immediately struck by the Queen of the Universe Shrine at # 3191. In November 1945 9-year old Joseph Vitolo had a vision of Mary, the mother of Jesus, here; she told him to pray for peace at a time the USA had just finished with a world war. Vitolo, now 73 [in 2010], still lives here. 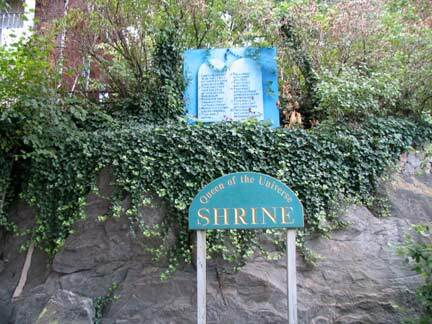 The shrine attracts visitors from all over the country and from overseas, much like the Bronx’ Little Lourdes in Bronxdale. The Grand Concourse finishes its northward run at Mosholu parkway, but not before shooting a narrow tributary northwwest toward Jerome Avenue called Risse Street, after the Conk’s original engineer, Frenchman Louis Risse, who modeled it after the grand Parisian boulevards designed by Baron Georges-Eugene Haussmann (both Risse and Haussmann came from Alsace). 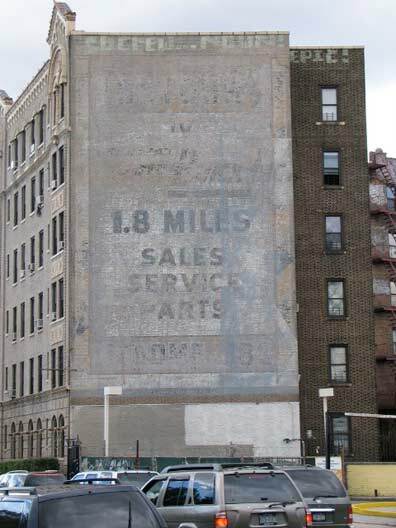 Along Risse Street can be seen an ancient ad for a service shop, and you can look up at the exquisitely excruciating on the eyeballs Tracey Towers, 41 stories of banality designed by modernist architect Paul Rudolph. 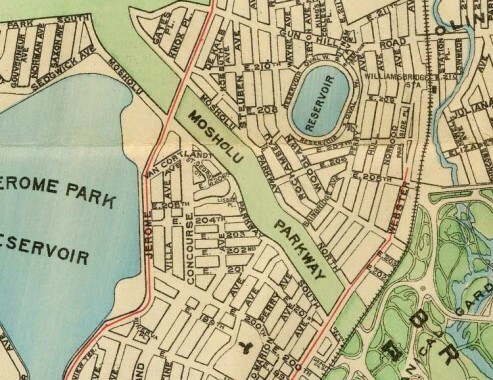 Excerpt of a 1900 map of the Mosholu Parkway area. With just a couple of exceptions, this could be used 110 years later and you’d still get where you’re going. 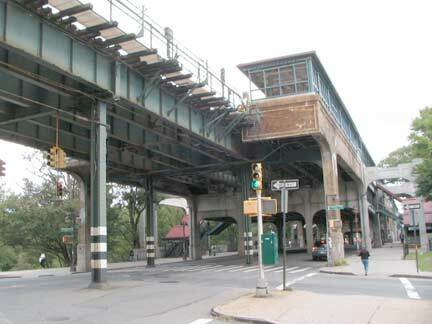 A stone archway takes Jerome Avenue over Mosholu Parkway, and in turn the steel trestle carrying the Jerome Avenue El (supporting the #4 Lexington Avenue line) is clad in concrete here, as well. 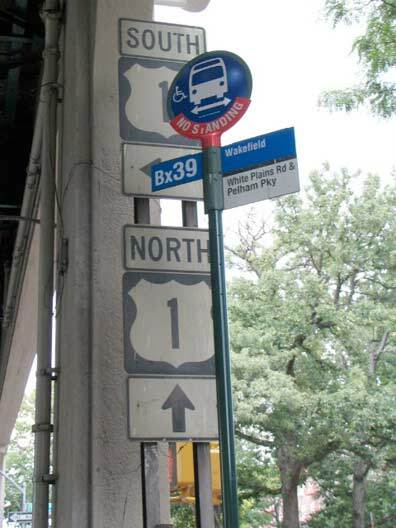 From Jerome Avenue Mosholu Parkway runs northwest into Van Cortlandt Park, where it meets the Henry Hudson Parkway. 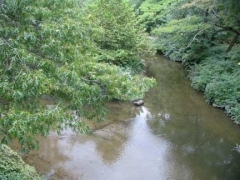 The two merge to become the Sawmill River Parkway. 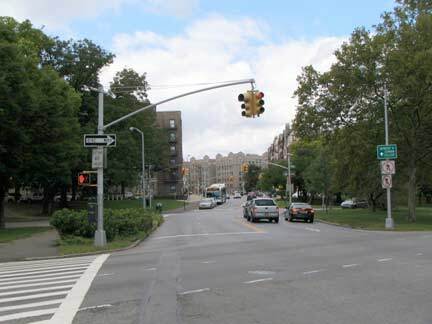 Only two streets cross Mosholu Parkway at grade, Van Cortlandt Avenue (looking east, left, and west) and Bainbridge Avenue. 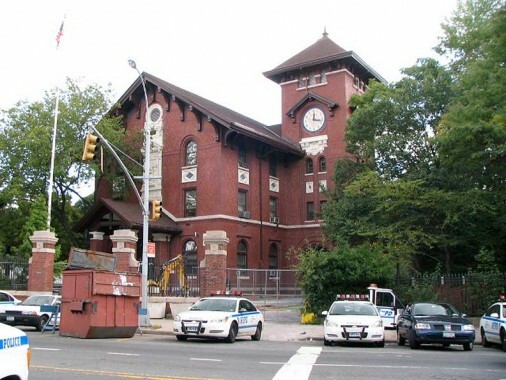 Both are historical Bronx routes: Van Cortlandt Avenue is a piece of the old Boston Post Road, and Bainbridge Avenue was once Woodlawn Road, leading to the large cemetery east of Van Cortlandt Park. 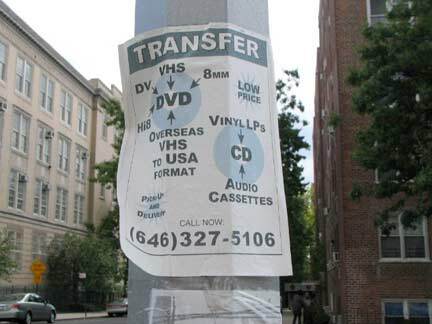 Classic Mosholu. When I first began poring over maps of NYC and other places in the late 1960s, I thought Mosholu was a Japanese name and I labored under that supposition for several years before I found out it was one of NYC’s many Native American place names. (The -olu or -oglu suffix also turns up in Turkish names). 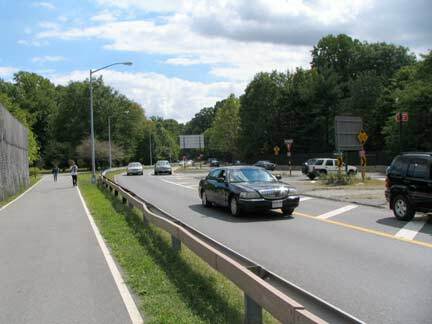 The parkway consists of a main four-lane roadway and two service roads that accept traffic from cross streets. 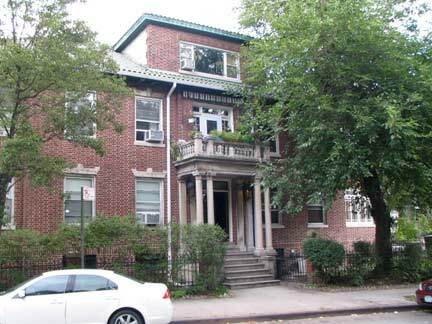 Because the Parkway crosses Jerome Avenue, the avenue that divides East and West streets and avenues in the Bronx, Mosholu is divided into East and West Mosholu Parkway. 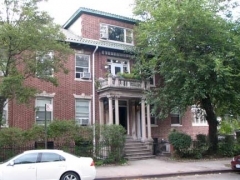 The service roads are called Mosholu Parkway North and South, and because of this division, we have the awkward monikers West Mosholu Parkway North and West Mosholu Parkway South, and East Mosholu Parkway North and East Mosholu Parkway South. 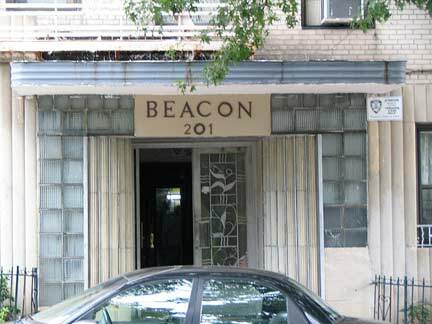 I liked this Moderne apartment house, the Beacon, at East 206th and EMPN. I would like a place with wraparound corner windows. 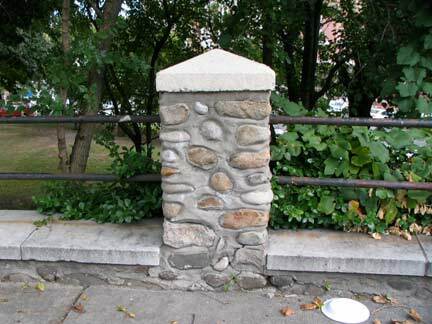 An East Mosholu Parkway North sampler. 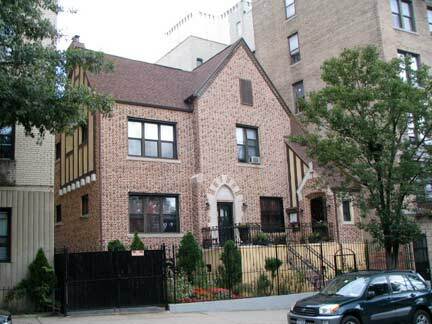 I cannot resist a good brick building, and the handsome Tudor is right next to the Beacon. Above right, just west of Bainbridge. At left, an odd triangle-shaped building at the NW corner of Bainbridge. 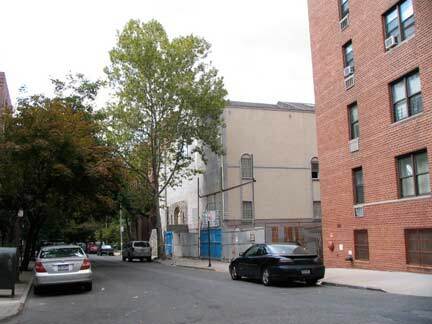 Apparently a strangely-shaped building lot because no street, or no former street, follows the slant. We’re on the edge of Norwood, which is very eclectic in its architecture. See this FNY page for a Norwood discussion, and photos of Mosholu Parkway’s war memorial, which I unwittingly bypassed on this walk. 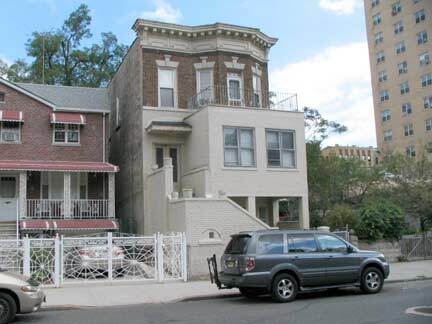 ForgottenFan Joseph Brennan: The strangely angled building at Bainbridge Ave avoids the former property of the Jerome Park Railway, which was closed in 1906. It started at the railroad behind the police station and made a big curve up to Bainbridge. In Google satellite images, you canmake out some of the curve in three blocks of buildings, from Decatur to Bainbridge. It then ran straight across the Parkway (at grade I think! 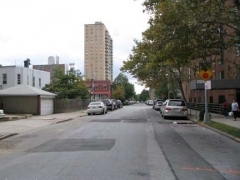 ), and then along the south side of 204th St, accounting for the shallower lots there. It curved again after crossing the Concourse, and you can REALLY see this curve in that white-roofed building between Villa and Jerome. It ended around Bedford Park Blvd, at the entrance to the Jerome Park Racetrack. The railroad was built to bring people there. The track closed in 1890, but the railroad was maintained another16 years to handle construction materials for the reservoir that was excavated on the site. I remember another curved garage on the former right of way, from Webster down to the railroad, but there’s a newer building there now. 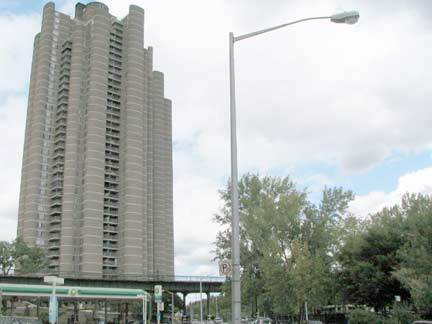 One of the most distinctive buildings on Mosholu isn’t actually intersected by Mosholu at all, but is visible from it. The parkway passes over Webster Avenue on an overpass as it nears its east end at the Bronx Botanical Garden, part of Bronx Park. 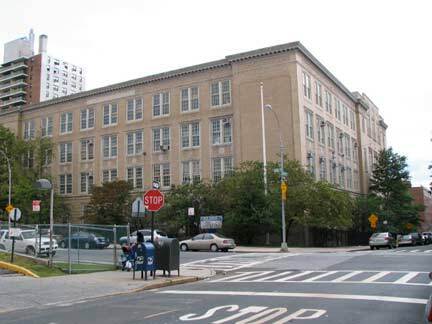 This is the New York Police Department’s 52nd Precinct. Designed by Stoughton & Stoughton in 1906, the building is constructed of terra cotta Brick in a Tuscan Villa architectural Style. 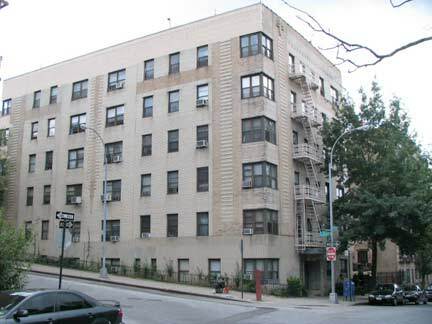 There are two buildings: the main building is used as the primary command of the 52nd Pct. which include the desk officer, offices, cells, etc. 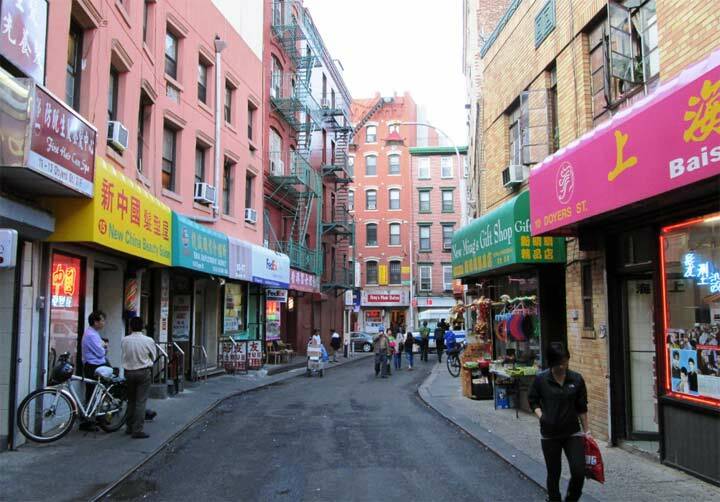 ; there is a also a stable of the same design which used for other precinct needs. 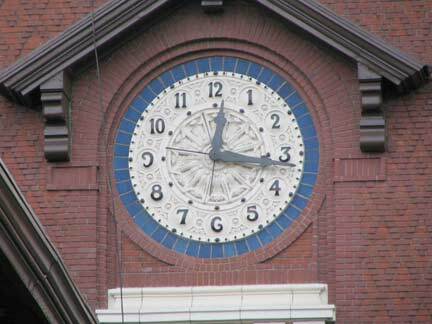 Of special note is its terra cotta blue and white clock, which is showing accurate time at least on the Webster Avenue side. 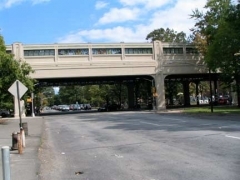 Mosholu Parkway is bridged over Webster Avenue. 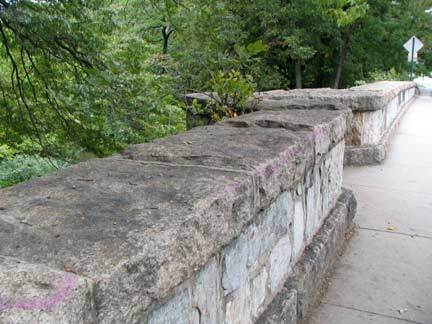 Note the distinctive walkway guardrails featuring stones embedded in concrete. 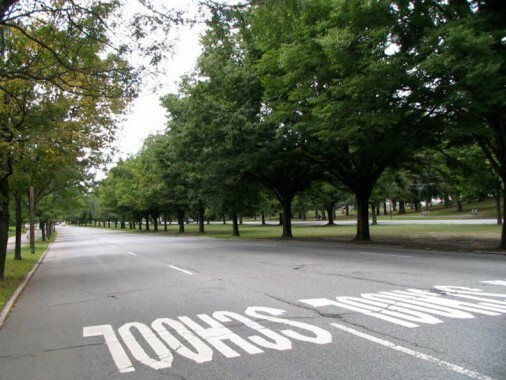 In the 1950’s and 1960’s, Moses, who served as New York City’s parks commissioner and arterial coordinator, advanced plans to reconstruct the Mosholu Parkway into a controlled-access route. 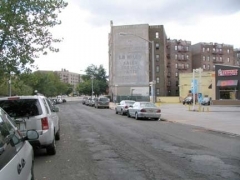 The $13.5 million reconstruction project was to not only cover the 3.0-mile distance of the parkway proper, but also include the construction of a 1.2-mile link to the Bronx River Parkway along the existing Dr. Theodore Kazimiroff Boulevard. 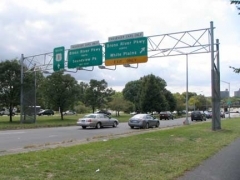 I’m not sure how far planning for this Mosholu Parkway “upgrade” went, but maps were never produced including it, unlike, say, the proposed Willowbrook /Richmond Parkway extension and Shore Front Expressways in Staten Island, which turn up on 1960s maps. 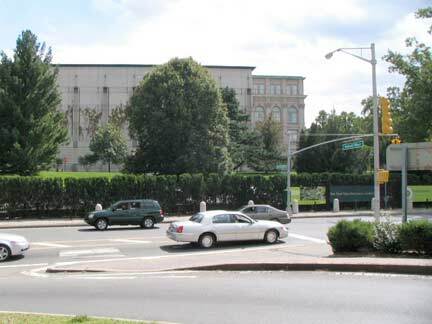 Mosholu Parkway’s eastern limit is at Dr. Theodore Kazimiroff Boulevard at the Bronx Botanical Gardens. From the ForgottenBook: The New York Botanical Garden and New York Zoological Park (known to all as the Bronx Zoo) are the two main divisions of Bronx Park, which was acquired by the city in late 1888 and early 1889. By 1891, the city had allocated fully 250 acres to be used as a botanical garden, which has developed into one of the world’s premier gardens, with visitors drawn year-round to its collection of temperate and tropical plants and perennials, with many acres of groves and gardens. 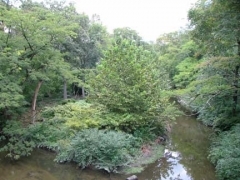 The Bronx River, which is generally a grimy, industrial flow of sludge south of the park, is here magically transformed back into the pristine fresh water brook it was before the Bronx was settled and even enjoys some swiftly rushing waterfalls here. A hemlock forest deep in the Botanical Gardens is left over from the pre-colonial era. The Gardens’ architectural marvels include the Enid A. Haupt Conservatory, built in 1902 and named for the woman who helped save it from demolition. Every Christmas, there’s an incredible model train show that incorporates dozens of famous (and not as famous) NYC architectural highlights, constructed from twigs, leaves, bark, berries and other natural materials by Paul Busse and his team at Applied Imagination at Alexandria, Kentucky. Formerly plain old, easily pronounceable Southern Boulevard, Kazimiroff Boulevard was renamed between Fordham Road through Bronx Park to Allerton Avenue in 1981 for one of the founders of the Bronx County Historical Society, a dentist who dedicated himself to preserving Bronx parks and ecosystems. The city re-renamed it Southern Boulevard in 2011. The Kazimiroff bridges over the Bronx River, which appears pristine as it meanders through Bronx Park. The narrow sidewalk here has to accommodate both pedestrians and bicyclists, but engineers helpfully punched out a notch where you can stand and observe the river from here. 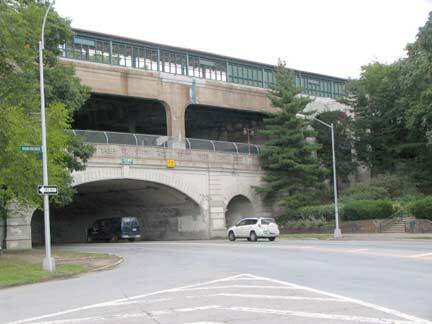 As Kazimiroff prepares to exit Bronx Park it has an interchange with the Bronx River Parkway, one of the Bronx’ earliest vehicular trafficways: construction began in Westchester County as early as 1917! Robert Moses picked up the baton and extended it south into the Bronx beginning in the early 1920s, reaching its Soundview southern limit in 1952. It was reconstructed according to modern specifications between 1992 and 1995. At the Kensico Dam, the Bronx River Parkway continues north as the Taconic State Parkway to Chatham, NY, where it merges with the NY State Thruway. It is named for the Taconic Mountains, the section of the Appalachian Mountains that run through upstate NY and New England. 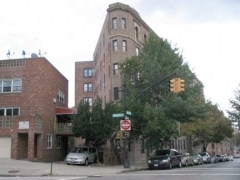 Upon exiting Bronx Park the Kazimiroff changes names again, becoming Allerton Avenue. 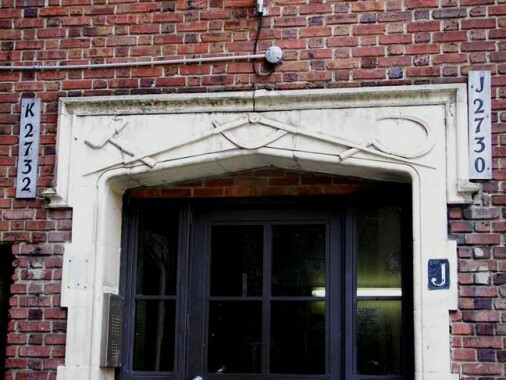 On the NE corner we see the apartment building once known as the Allerton Avenue Co-Ops, and the symbols above some of the entrances bespeak the ascendance the Communist Party once had in NYC and the United States. 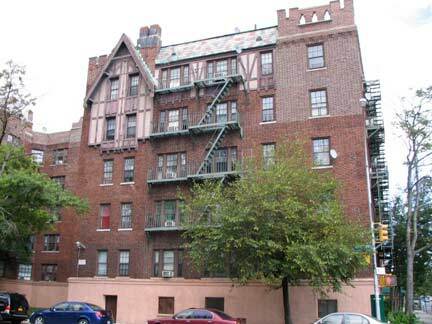 The Allerton Avenue Co-Ops, Allerton Avenue and Bronx Park East in Bronxdale, were designed by the architects Springsteen and Goldhammer between 1927 and 1929. The buidlings were sponsored by unionized Eastern European Jewish garment workers. The hammer and sickle has long been used by the Communist Party as a symbol of the union of the workers (the hammer) and the proletariat, or the peasants (the sickle). It was introduced on the Soviet flag in 1922, replacing the earlier hammer and plough. 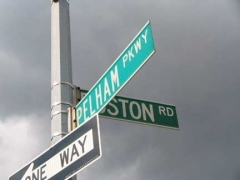 There isn’t a direct connection, for traffic at least, between Mosholu and Pelham Parkways; Pelham Parkway is an eastern extension of Fordham Road, a half mile to the south. To reach Pelham Parkway, I walked south on Barker Avenue and noticed a very old “Department of Traffic” sign, a desecration of a perfectly good two-family house, and a high rise built on bedrock. 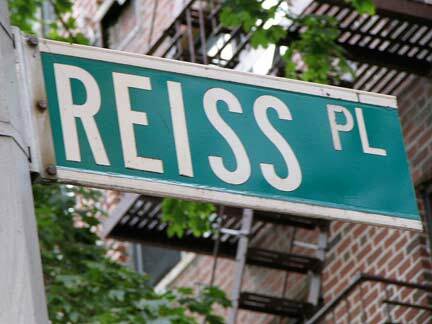 Reiss Place is a fairly nondescript passage that runs for a block between Bronx Park East and Barker Avenue just north of Pelham Parkway, but since we’ve seen Risse Street already I thought it fitting to visit here. Odd that the Bronx has two different streets pronounced exactly the same. The name remembers George Reiss, an 1890s landowner whose pond was used by local kids as the ol’ swimming hole when the Bronx was rural. Just south of Reiss Place, Barker Avenue finally intersects Pelham Parkway, which is definitely in auto traffic mode here and not the greenway it becomes east of White Plains Road. Heading east on Pelham, its first major intersection is with Boston Road, and the NYC Department of Transportation doesn’t quite know what to do with the route here. 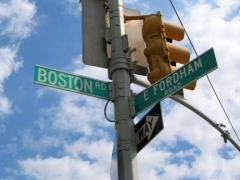 Is it the eastern end of East Fordham Road, or does Pelham Parkway begin at Fordham Road’s intersection with the Bronx River Parkway in Bronx Park? 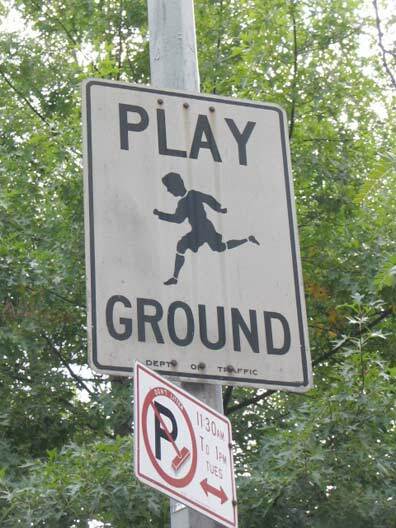 The DOT isn’t sure, as it has installed two different signs, hedging its bets. In his NY Times review of Eric Jaffe’s The King’s Best Highway, Joseph Berger calls Boston Road in the Bronx (left) “a ribbon of retail dotted with Dunkin’ Donuts franchises, gas stations and drive-through banks.” True to its name, you will reach Boston if you stay on this road all the way to New England, as it becomes US 1. However, contrary to popular opinion, Boston Road in the Bronx is not part of the colonial-era Boston Post Road. 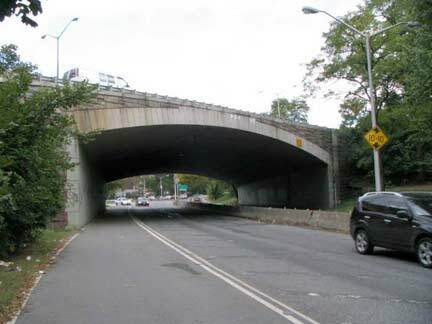 According to the late Bronx historian John McNamara, Boston Road was constructed by surveyor John B. Coles in 1794. It is a reroute of the original Boston Post Road, which was started in 1672 as a mail route between Boston and NYC (a 270-mile distance), following a network of Indian trails. 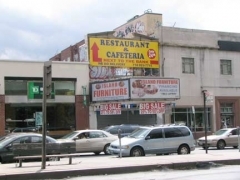 The original branched off north of the present Boston Road in the Bronx; its present route is marked by Kingsbridge Road in Mount Vernon and by Bussing Avenue, Barnes Avenue and Gun Hill Road in the northern Bronx. 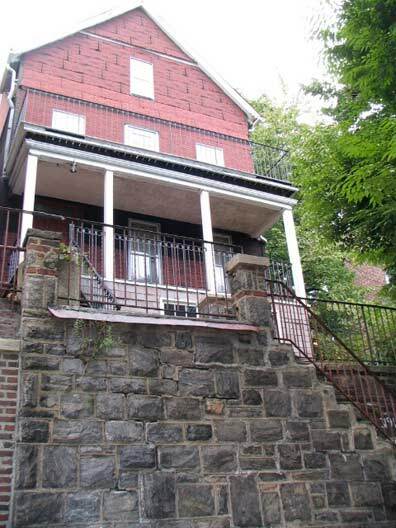 Lewis Morris, an early Bronx honcho (as were many of the Morrises) wanted the Post Road to run through his property; enter John Coles. In fact, early on, that road was known as Coles’ Boston Road. North of what would become the Bronx-Westchester line, the two roads converged and continued north. Further north, the Post Road would separate into more tributaries, each reaching Beantown via a separate route. In those days, what takes a few hours by car then took a few days by horse or coach. Pelham Parkway soon passes White Plains Road, another rather confusingly named route — it doesn’t go to White Plains, since once you reach Mount Vernon, you have to veer around from road ro road to get you there. 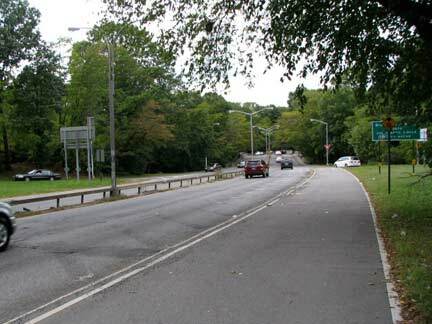 This particular route was constructed in 1863 to replace a winding colonial-era route that did reach White Plains. The concrete el structure has recently been scrubbed and repainted, and platforms have received new stained glass artwork (or thick plastic that looks like glass). 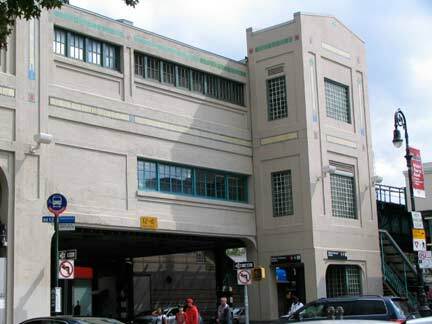 This is the #2 line that eventually winds up on 7th Avenue in Manhattan, terminating at Flatbush Avenue in Brooklyn. 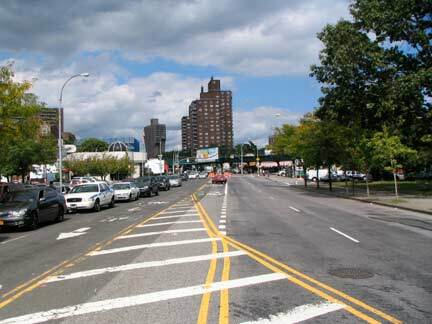 In the Bronx, US 1 runs mainly on Fordham Road and Boston Road. The remains of the Globe Theatre, named for the Renaissance-era theatre in London that staged William Shakespeare’s work, are here on the south side of Pelham Parkway. It looked like this when it was a theater.